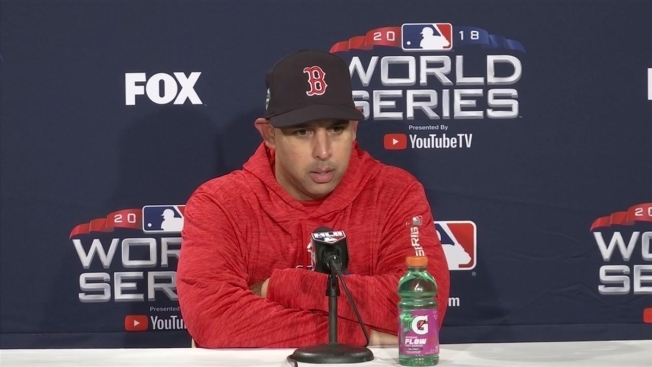 Just about every decision Alex Cora has made all season has worked to perfection, so why stop now? With the Boston Red Sox nursing a one-run lead over the Los Angeles Dodgers, Cora elected to use Eduardo Nunez as a pinch-hitter for Rafael Devers in the bottom of the seventh inning at Fenway Park tonight. The somewhat surprising move yielded electrifying results, as Nunez swatted a three-run homer over the Green Monster off Alex Wood to increase Boston's lead to 8-4. That would hold up for a final, giving the Red Sox a 1-0 lead in the 2018 World Series. Devers, who has received the majority of the playing time at third base for Boston in the playoffs, was 6 for 14 (.429) when Cora swapped him out for Nunez, who had been just 1 for 5 (.200) entering the game. That, and Devers had what stood as the game-winning RBI in his previous at-bat, a two-out single in the bottom of the fifth. It was the first postseason home run for Nunez since 2012, when he was a member of the New York Yankees. Boston never trailed, but as starter Chris Sale labored through four innings of work, Los Angeles rallied to tie the game twice before its luck ran out. Sale threw 91 pitches, facing one batter in the fifth inning before Cora pulled him in favor of Matt Barnes. Barnes gets credited with a win in his first World Series appearance despite allowing Brian Dozier, whom Sale had walked, to score to tie the game at 3-3 at the time. Andrew Benintendi went 4 for 5 with three runs scored for the Red Sox in his World Series debut. Mookie Betts singled to lead off the bottom of the first inning off of Dodgers starter Clayton Kershaw, who took the loss for LA. He came around to score after stealing second base on a Benintendi single to break open the game's scoring. Benintendi also scored in the first, coming around on a J.D. Martinez single. Matt Kemp hit a solo home run off Sale in the top of the second to slice his team's deficit in half, while the Dodgers pulled even an inning later on a Manny Machado RBI single that plated Justin Turner. The Red Sox jumped back ahead in the home half of the third after Martinez plated Steve Pearce, who reached on a fielder's choice. Pearce was initially ruled out, but Cora challanged the call and saw the ruling overturned. Los Angeles tied things up again in the top of the fifth, with Machado plating Dozier on a ground out to second base. 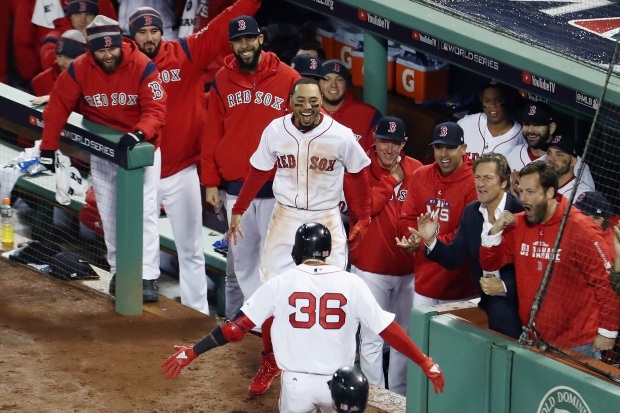 Xander Bogaerts gave the Red Sox the lead for good on a fielder's choice that produced the second run of the game for Betts, followed by the Devers RBI single that stood as the game-winner. The Dodgers came within a run on Machado's third RBI of the game in the top of the seventh, a sacrifice fly that brought in Max Muncy, but Los Angeles could get no closer. Of note, Craig Kimbrell threw a perfect ninth inning for the Red Sox, though he wasn't credited with a save due to the four-run margin. Game 2 is Wednesday night at 8:09 p.m. back at Fenway.